Make Your Own Foaming Hand Soap! I always look for the word "antibacterial" when I am buying hand soap. I find benefit in using an antibacterial soap, especially when I have been handling chicken, fish or any meat for that matter. The only problem with antibacterial soap is that it makes my hands dry and sometimes gives me a rash. Most store-bought antibacterial soaps have chemicals in them, which is probably the main reason for my dry, rough hands. I started looking for a soap that is antibacterial, yet easy on the skin and economical and it appears the best solution may be to make my own. After searching the Internet, I noticed that many people were making their own hand soap and saving money. My researched showed that many are using castile soap because it was gentle on skin and all natural. My mother used castile soap on me to help with my sensitive skin when I was a little girl. I remember mom buying the soap in bars which was all we had back in those days. Many of us don't like using bars of soap anymore for hand washing when liquid soap is more convenient and less messy. I fancy fluffy foaming hand soap. But again we have the chemical and dryness issues. And, I still wanted to make sure the final product was antibacterial. Many ingredients are optional and you can be flexible with moistening oils and essential oils. There are only three essential ingredients; a bar of soap, water and glycerin. The moisturizing oils and antibacterial essential oils, such as lemon or tea tree oil, are both optional. You will need an essential oil or some other antibacterial agent if you want this soap to antibacterial. Let me share with you my soap recipe and give you 5 good reasons it's a good idea to make your own. Nondrying: This soap unlike most antibacterial soaps will not dry your skin because of the rich oils that are listed below. Easy: This whole process only took about 30 minutes. I did have to wait until the next morning to use it. You control all the ingredients: The best reason for making this soap is that you control the softening agents, the fragrance and all the ingredients. Consequently, you also control the cost. Economical: Let's face it; we all like to save money. For $4 -$5, you can have a gallon of liquid soap. The price will vary depending on what kind of essential oils, if any, you use. And, of course, what kind of moistening oil you use. I found that olive oil from the kitchen works like a dream or you can buy something special like jojoba or sweet almond. I used grape seed oil in this recipe, which I happened to have in my cupboard. Satisfaction guaranteed: The soap is your creation so you are guaranteed to have the ingredients you want and the satisfaction of it being homemade. Here are five great reasons to make your own antibacterial soap. 1. Non-drying: This soap unlike most antibacterial soaps will not dry your skin because of the rich oils that are listed below. 2. Easy: This whole process only took about 30 minutes. I did have to wait until the next morning to use it. 3. You control all the ingredients: The best reason for making this soap is that you control the softening agents, the fragrance and all the ingredients. Consequently, you also control the cost. 4. Economical: Let's face it; we all like to save money. For $4 -$5, you can have a gallon of liquid soap. The price will vary depending on what kind of essential oils, if any, you use. And, of course, what kind of moistening oil you use. I found that olive oil from the kitchen works like a dream or you can buy something special like jojoba or sweet almond. I used grape seed oil in this recipe, which I happened to have in my cupboard. 5. Satisfaction guaranteed: The soap is your creation so you are guaranteed to have the ingredients you want and the satisfaction of it being homemade. Essentail Oils (such as lemon or tea tree oil) or use Nutribotic GSE (concentrated grape seed oil) which is also antibacterial. You can buy this in any health food store. Bring 4 cups of water to a boil. Add grated bar of soap. Stir continually until dissolved. Cool for 15 minutes and add vegetable glycerin and olive oil. When completely cool add the essential oils. 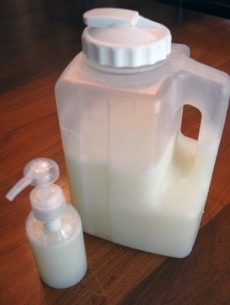 Pour into gallon jug for storage and fill any regular foaming soap dispenser. So there we have it! It's easy, economical, all natural & antibacterial soap. You have to have a foaming dispenser, if you want your soap to be foamy. 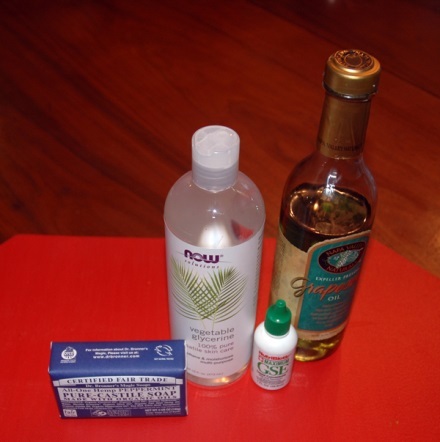 You can use liquid Castile soap instead of a bar but it will cost you a lot more money for the convenience. I am happy with this hand soap. I give it a 4 star rating!